In the second decade of the 12th century, at the height of his fame, Church scholar, theologian, Benedictine monk Peter Abelard engaged in a passionate love affair with his young disciple, Héloïse. For them, their carnal love was an expression of the divine, but their liaison was thwarted in more ways than one, for Héloïse’s uncle avenged that debt of honor, while Church authorities banished Abelard from the pulpit, first, for his desecration of his chastity vows, and, twenty years later, for heresy—his emphasis on reason to explain Church doctrine, his rumored friendship with the Judaic community of France, and his vehement defense of it against the sanctioned practices of the Church, were points of contention. In modern day Manhattan (c. 1950), Catholic priest Michael Kavanagh is celebrating a Mass when a friend he hadn’t seen since his days as a Seminarian refuses to take communion from him. Father Kavanagh follows his friend to Inwood Park, where, amidst a sudden rainstorm, he takes refuge in the nearby The Cloisters—a museum of medieval art that is an architectural montage from remains of medieval monasteries in France. Coincidentally, Father Kavanagh meets Rachel Vedette, a young museum guide and Jewish scholar, whom enlightens him on the motivations behind the author whose book he is reading. Over the course of several informal encounters, Rachel and Father Kavanagh discuss theology, Abelard and Héloïse’s epistolary, and the repercussions for the Jewish people—of that era and henceforth— of the Church’s condemnation of Peter Abelard and Its departure from his teachings. Sensing in Rachel a sympathetic spirit, Father Kavanagh confesses how the reappearance of his long-lost friend has triggered his soul-searching and the quest for answers about what prompted his friend to leave the Seminary long ago. Because of his inherent kindness, she gradually opens up about her horrible experience during the Holocaust. I did not know anything about Peter Abelard nor Héloïse. I chose to read The Cloister because it was about a religious scholar and I am very much into that. Bring me novels about monasteries and priests and I will be content. Thus, imagine my satisfaction when I start getting comfortable with the pace of the story, and I find out that, unbeknownst to me, I have always agreed with some of Peter Abelard’s ideas. 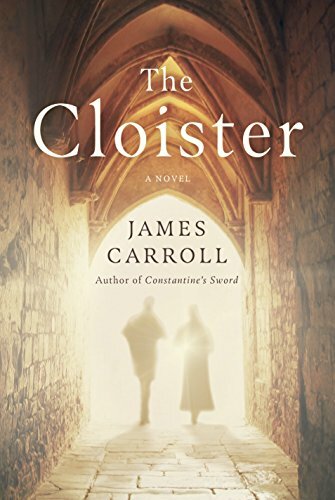 The Cloister by James Carroll delivers in many ways, and all in spades. Not only it has appeal as a love story because of the transcendent feelings between Peter Abelard and young Héloïse, but it also has the drama and the bitterness of a love thwarted—they faced, together and individually, fascination by the populace (trovadours sang about them), cruelty, bitter rivalries, disillusionment, and banishment. Then there is the subplot of the dangerous ideas that Peter Abelard championed, which went against Church doctrine. In writing about Abelard’s ideas, of his study of the teachings of prominent Jewish scholars of the age, and of his application of logical reasoning to explain the divine mysteries, James Carroll has put anti-Semitism on display and has attacked it head on. The novel has three separate storylines that happen more or less timelessly, though one can piece together the dates in which events occurred because of the reference to certain historical personages, such as King Louis VII of France, his wife Eleanor of Aquitaine, and Senator McCarthy. In medieval times we follow the story of Peter Abelard and Héloise from the time they met to the fate that befell them. In modern times we follow two subplots. First, the story of Jewish father Saul Vedette and his daughter Rachel, who live in Paris during the Nazi-backed Vichy regime. Saul is a scholar of medieval studies writing a book that may challenge conventional thinking on the postures of Abelard towards the Jews. Rachel assists him, but the roundup of Paris’ Jews by French police in 1942, their temporary imprisonment at Vel’ d’Hiv, and subsequent transfer to a concentration camp, change their lives irrevocably. Last, circa 1950s, we meet Catholic priest Michael Kavanagh who is shaken by an awkward encounter with a long-lost friend, which triggers in him a soul-search, quest for answers, and a final reckoning. Despite me finding the medieval story arc appealing, I found myself preferring Rachel Vedette’s Holocaust story, which was as horrific as it was entrancing. That is usually the case for me with Holocaust stories because each account is horrifyingly unique. I liked the subplot of Father Kavanagh too, despite dealing with the rottener issues of the Church. The Cloister has a nice pace, neither slow nor fast, just right. James Carroll is a gifted storyteller; I liked his writing style from the very beginning. The novel was a solid four stars from start to finish, though I felt that some passages, especially the ones in which Peter Abelard discussed his theology, dragged a bit. It may be a matter of preference, but abstract ideas tend to bore me; theology is no different in that regard. Overall, I think The Cloister by James Carroll should be obligatory reading for all Christians. It may challenge what you have been taught. Wonderful review Carmen of a book I am putting on my lists. I am currently reading, in between other books, Will Durant's The Age of Faith. It is a long tome about the Middle Ages in Europe and a fascinating history of the events that probably lay behind parts of The Cloister. So it will all fit together for me. Thanks, Judy. How I envy you your reading superpower. I would knock off my TBR in a year! ;-) The Age of Faith seems like a tome I would enjoy, despite its length. I'll keep it in mind. 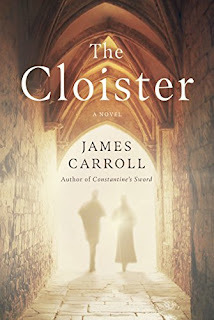 I think The Cloister would be an excellent companion to that book. I hope you like it if you get to it. I've always found the tragic story of Eloise and Abelard fascinating. Much of my fascination is with the period in which they lived and the constraints which the prevailing theology of the time placed on ordinary and extraordinary people. This book sounds like one that I might find interesting. Which reminds me - I need to get back to reading more historical fiction. If you admire them, you would like this novel. You are right, it was a fascinating period, at least seen in retrospect. ;-) Historical fiction is calling out to you, answer the call. I hope you enjoy this tome if you decide to give it a try. This sounds really interesting. I don't know anything about Peter Abelard and Heloise either, so I would like to learn more about them, but the other storylines sound intriguing too. It was new to me too, at least the medieval subplot. I highly recommend you this novel. Being a historical fiction fan you might enjoy it. Thanks, Susan. Their epistolary is discussed in this novel. I would love to read more on them, as well as more of James Carroll's works. Do you know if he has any link to the Church? He has written about the Church in varying degrees before. Yes, I think Carroll went to seminary school and was a Catholic priest in his earlier years. & later became a writer. Thanks, Susan. 👍That makes sense. I thought so. This is a wonderful review, Carmen. This books sounds really interesting! Thanks, Angela. It was interesting and quite a learning experience as well. Great review of a book that I'm now really interested in checking out. I think my dad would like this one too. Who doesn't like stories with monasteries and priests!